A healthy, natural looking smile boosts self-confidence and can have a big impact on our personal and professional lives. First impressions are key and a radiant smile goes a long way in making a positive one. With Fab Smile custom veneers you can cover blemishes and restore your smile. This affordable, cost-effective solution can give you the natural looking smile you thought you had lost for good. Veneers can cover a host of dental issues from teeth which are chipped, discoloured or crooked, through to covering visible gaps. 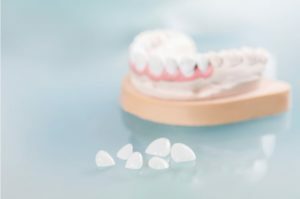 These thin porcelain veneers are durable, lasting up to 15 years, and are simple to clean and maintain. Custom veneers are easy to clean, providing a simple way to preserve a perfect smile as you go about your everyday life. Daily brushing and flossing remain as important for veneers as it is for your natural teeth. Custom veneers are made to suit the individual and perfect their smile. With a good oral care regime you can ensure your veneers retain the sparkle they had when they were first fitted. It is best practice to use a soft-bristled toothbrush and a non-abrasive toothpaste. Veneers are strong and durable with problems relating to them uncommon. However, maintaining regular dental check-ups will help spot any issues early. Along with brushing and flossing, these dentist visits help prevent other oral conditions such as gum disease which can ultimately impact on the smile your veneers have enhanced. Use a mouthwash free of harsh chemicals or containing alcohol as alcohol can soften the bonding agent holding the veneer to the teeth. Although veneers are stain resistant it is still best to try to avoid food and drinks which are known to stain, including coffee, tea, red wine and dark sodas, as well as smoking. Similar to natural teeth the danger from these food and drink items is possible staining over time. We all pick up bad habits over time, some we do not realise we are even doing. Although veneers are durable, avoid chewing on hard objects such as pens and ice to prevent any chance of chipping your veneers. Fab Smile Veneers are a comfortable, pain-free solution to regaining a smile you can be proud in. With minimal care needed they are a cost-effective and time-effective way to have the perfect smile you always wanted.